I published this list of stores already last year for the 2012 Fat Quarterly retreat but thought it worth publishing again for this year's retreat. We have one new addition on this list which is Annie Barker's 'Village Haberdashery' that of course existed already as an on-line shop last year but is now also a proper Brick and Mortar store in West Hampstead. I made a specific Page on my blog where you will find the below list from now on permanently. 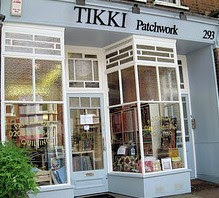 First of is my local quilt store (LQS) Tikki Patchwork. Isn't it wonderful if you are lucky enough to say that you have an LQS ! Tina who owns the shop has a fantastic selection of modern quilting fabric in her store and also stocks a large variety of embroidery thread plus all sorts of haberdashery. Although the shop is small, I almost always find what I am looking for and of course a lot of what I am not looking for. One warning though, be aware of the opening hours and always check the website before you set of or better even call to make sure Tina or Corinne are there. If you are after Liberty fabric then all you need for your happiness is Shaukat. Yes you read correctly not Liberties of London but Shaukat. The reason why I am recommending this shop which is located in South Kensington is because it has the largest selection of past and new Liberties collections you can possibly imagine. In addition Shaukat stocks fine wool for suits and other attire, stripes, dots and wonderful silks. You name it they have it. Shaukat caters mainly for the Far Eastern Market and has a lot of pre-cuts that start with several meters but they are happy to cut as small as 0.5 meter of the bolt. The prices are similar to those at Liberties of London but you do find bargains and discounts that you do not find at Liberties. Shaukat also have on-line shopping. Liberties of London can of course not be missed on the list. 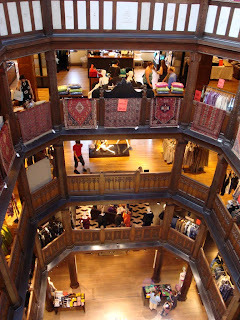 I do visit this wonderful beacon of style regularly and although I tend to buy my liberty tana lawn at Shaukats I still love checking out the displays and brows the Rowan fabrics they stock and of course the lovely selection of wool. Liberties also have on-line shopping. This is my guilty pleasure shop. 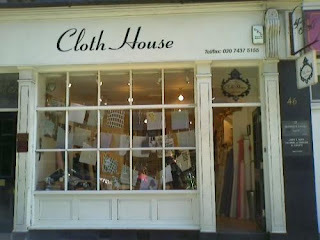 My heart regularly misses a beat from pure excitement when I approach the Cloth House at No 47 Berwick Street. The Cloth House has two branches and the one in 47 Berwick Street stocks a lot of gorgeous linens, canvas, Thai Hemp and Indian and Japanese fabrics plus a million bits and bobs. It is utterly gorgeous and the staff are very helpful. The other branch at 98 Berwick Street stocks silks, cottons, trimmings, velvets, woolens etc. While you are in Soho have a wonder around Berwick and Broadwick Street and its many side streets. You will find a multitude of shops selling fabrics here and most specialize in silks (Berwick Street Cloth shop, Broadwick Silks, The Silk Society to name just a few shops). Walk around, browse and nip into some of the great cafes around there where you can play the game of people spotting to your hearts content. John Lewis branches in Oxford Street and Sloane Square have sizable haberdashery departments. They stock more wool then quilting fabric but either is worth a visit though the flag ship store on Oxford Street has a better selection. Both stores stock an excellent selection of home decor fabric and have superb sales in Summer and Winter. John Lewis do have on-line shopping. MacCulloch & Wallis are a haberdashery store just a stone through from Liberties and John Lewis. 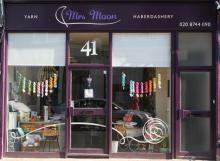 They have a fantastic selection of everything haberdashery and also a large variety of fabrics. 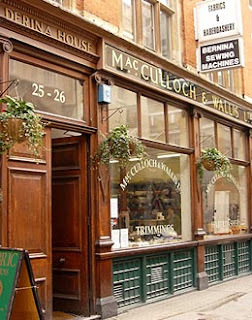 It is a great shop and whenever I do have to buy haberdashery then I tend to go there rather than to the big stores and to be honest MacCulloch & Wallis actually have much more stock than John Lewis and Liberties of London. They do have on-line shopping. The Village Haberdashery is a new addition Brick and Mortar store in London. Annie, the owner started of with her online-shop early 2012 and was fast to add a real live store towards the end of the that year. 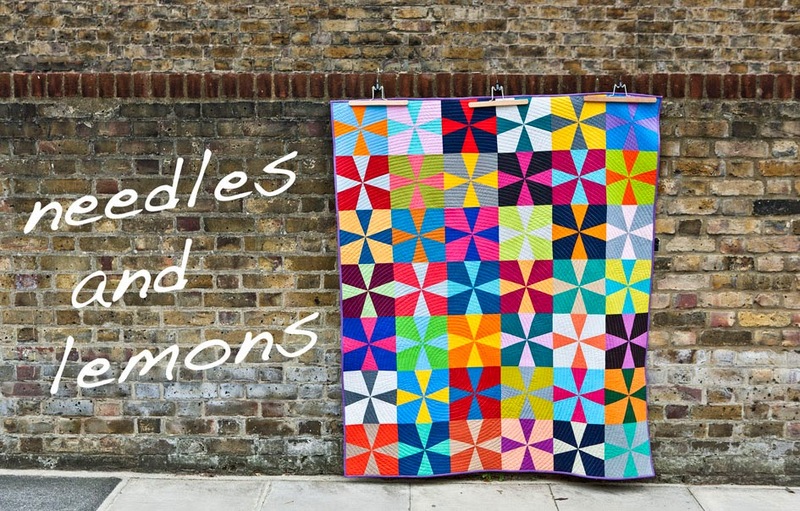 The shop has a great selection of contemporary quilting fabrics and haberdashery. Annie stocks all our favourite fabrics, be it Melody Miller, Denyse Schmidt or the ever popular Kona Cottons of which she has a large selection. The shop is in walking distance from West Hampstead train and tube station. The shop is open every day of the week but please do check for opening hours on the shop webpage. From April 2013 Annie also offers classes. 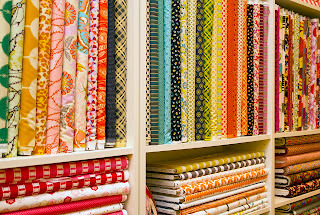 Fabric Galore is a very popular shop amongst the London sewing crowd. They are located in Battersea on Lavender Hill. 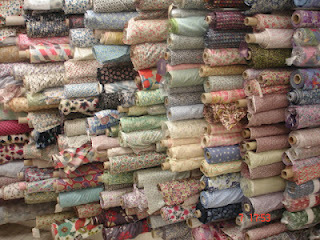 Fabric Galore has a large selection of home decor and quilting cottons, oilcloth and also fabric for clothes sewing. A truly fantastic selection to even more fantastic prices. They have a fast turnaround and you often find fabric from past collections there. There is no on-line shopping facility though. 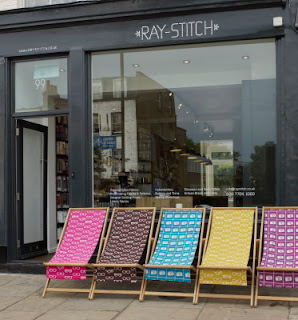 Ray Stitch opened up premises in 2011 in Islington after having started as an on-line shop. 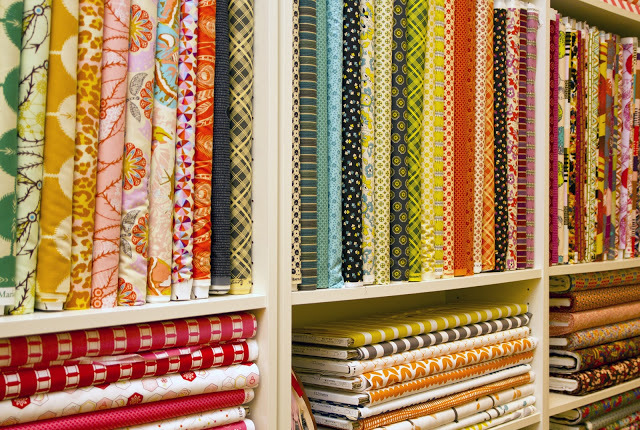 They have a beautiful selection of contemporary quilting cottons including Japanese imports in addition to ribbons, buttons, threads, bits and bobs. And the best thing is that the shop doubles as a cafe with incredibly delicious cakes and well brewed coffee. What can you want more than a little sweet snack after the hard work of fabric shopping ! In 2012 Ray Stitch also started to offer classes. Mrs. Moon is a yarn and fabric store located in St. Margrets (just outside London, a little further than Kew where Tikki is located). 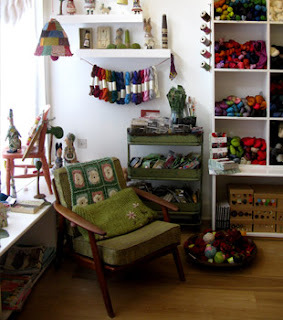 They stock a wonderful selection of yarns and also a small selection of quilting fabrics. They stock a sizable selection of Rowan yarns, Debbie Bliss, Noro but also Scrumptuous Lace that I have bought a few times now because it is very soft and lovely to work with. Mrs. Moon also has an online-shop. This is really useful, thanks for doing this Judith. See you in 2 days!! Oh my, now I really must add London to my near term travel list!! !